In technical trading, you use volume (the number of shares or contracts of a security traded in a period) to measure the extent of trader participation. When a price rise is accompanied by rising volume, you have confirmation that the direction is associated with participation. You have outright, direct evidence of demand. Similarly, if you see a price fall by a large amount, but the change isn’t accompanied by a change in volume, you can deduce that the price change was an aberration. Some trader made a mistake. Volume tells you only the number of shares or contracts traded, not the number of participants. Obviously, you can get a jump in volume that is due to only a handful of participants, and then you will be drawing the wrong inference from high volume. Volume sometimes leads price. The most obvious situations are when volume spikes. A spike is a volume number that is double or more the size of volume on the preceding days. Say volume has been running at 100,000 shares per day for several days or weeks, and suddenly it explodes to 500,000 shares. If the price had been in a downtrend, this wild increase in volume means that the crowd is throwing in the towel and exiting en masse. When everyone has jumped off the bandwagon, get ready to jump back on. Nobody’s left to propel the price lower. Conversely, the same advice is usually correct when you see a volume spike as the price is making new highs. The underlying principle is the same — the crowd has exhausted its supply of cash. A volume spike is one of the occasions when fundamental information is complementary to a technical observation. Beware a price making new highs coupled with a volume spike when there is no fresh news or fundamental information that attracted new buyers. Chances are that the top is in. If the security has new, legitimately exciting news and you can reasonably deduce that it attracted new buyers, you have a nontechnical reason to ignore the usual spike interpretation. On-balance volume (OBV) is a single number representing cumulative volume. A market technician named Joe Granville devised the OBV indicator to display volume adjusted as follows: To calculate OBV, you add volume on days that the close is higher than the day before and subtract the volume on days that the price is lower than the day before. You’re assuming that when the price closes higher than the day before, demand was greater than supply at each price level. Buyers had to offer higher prices to get holders to part with their shares. The down move: In the section of this figure marked by the ellipse, the price down move, already in progress, is suddenly accompanied by a big rise in volume. The increase in volume starts the day before the downward gap. A falling price punctuated by a downward gap is a message that the price is going to fall farther. The OBV indicator forecasts the impending bottom, falling ahead of the volume spike and the gap. If you own the stock and see the OBV indicator start to decline and then you see spiky volume (like the area in the ellipse), you should sell. Holding on after the downward gap is to court a fat loss. 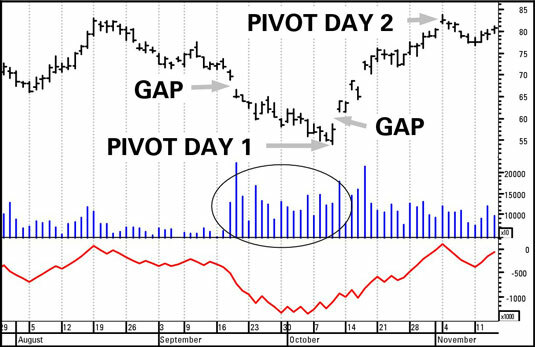 The up move: OBV reaches its lowest levels about two weeks before Pivot Day 1, which features the lowest low in the series of lower lows, but a higher closing price and a gap upward the following day. In this figure, OBV is already rising while the price is still falling, a divergence that is a critical clue to an impending change in the direction of the price.